On November 8, the Trump Administration announced new regulations regarding U.S. citizens traveling to Cuba and Americans transactions with certain Cuban entities, all as discussed in yesterday’s blog post. Here are initial reactions to that announcement in the U.S. and in Cuba. Senator Marco Rubio (Rep., FL), a major force for harsh U.S. measures about Cuba, had a luke-warm reaction to the new U.S. regulations. He criticized the State Department for failure to include on the Cuba Restricted List “several entities and sub-entities that are controlled by or act on behalf of the Cuban military, intelligence or security services They Gran Caribe Hotel Group and Cubanacan,” which are owned by the tourism ministry, not the military. Josefina Vidal, Cuba’s top diplomat in the 2015-16 bilateral negotiations, said the new rules were a “serious reversal” in ties between the two countries. She believed the new regulations were unjustified and a great political nuance. They adversely will affect U.S. businessmen, who will lose interesting business opportunities existing on the island today, as opposed to their competition. At the same time, they will harm the Cuban economy, both the state and the private sector. This blogger sides with the critics of the new regulations. Engage Cuba Statement on New Cuba Sanctions (Nov. 8, 2017); Leahy, BREAKING: Leahy REAX To New Treasury Dept. Regs. Restricting Travel & Transactions By American Citizens In Cuba (Nov. 8, 2017); Rubio Statement on New Regulations to Implement the President’s Policy to Empower the Cuban People (Nov. 8, 2017); Rubio: ‘Bureaucrats’ to blame for softening Trump Cuba policy,’ Miami Herald (Nov. 8, 2017); Diaz-Balart: Regulations Are First Step Towards Implementing POTUS’ Cuba Policy (Nov. 8, 2017); Ros-Lehtinen Responds To Announcement of New Cuba Regulations (Nov. 8, 2017). Assoc. Press, The Latest: Cuba Says New Trump Rules Mark Reversal for Ties, N.Y. Times (Nov. 8, 2017); Gomez, Washington deepens retreat of relations with Cuba (+ Video), Granma (Nov. 9, 2017); Measures restrict rights of the Americans and will damage the Cuban economy: Josefina Vida (+ Video), CubaDebate (Nov. 8, 2017). On November 2 Cuba’s Foreign Minister Bruno Rodriguez accused the U.S. of “lying” about medical problems of U.S. diplomats who were serving at the U.S. Embassy in Havana. He said, “I can affirm categorically that whoever affirms that there have been attacks, deliberate acts or specific incidents as a cause of these health damages, deliberately lies. These health damages are being used as a pretext of a political nature, with political objectives, to eliminate the progress made and damage the bilateral relationship” between the two countries. The same day Rodriguez met with 12 U.S. senators and representatives on Capitol Hill. 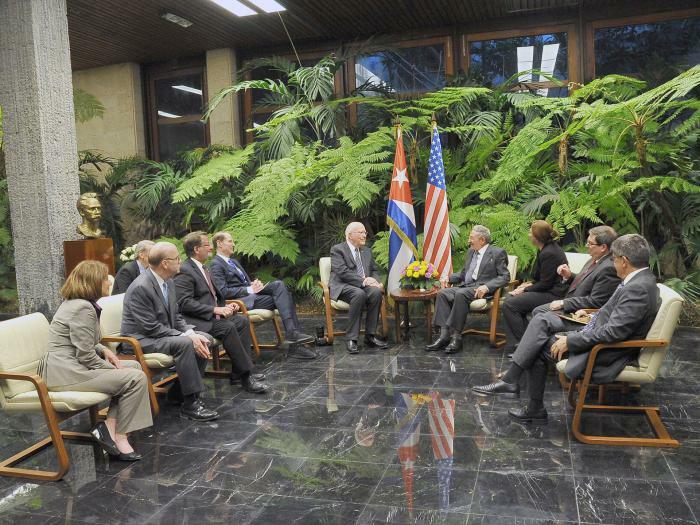 Although not identifeid in the U.S. or Cuban media, photographs of the meeting show Senators Patrick Leahy (Dem., Vt), Jeff Flake (Rep., AZ) and Amy Klobuchar (Dem., MN), all advocates of U.S.-Cuba normalization. Now we await the U.S. response to this accusation. 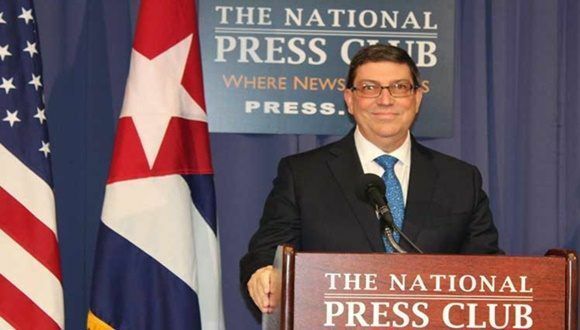 Bruno Rodriguez: There is no evidence of a sonic attack on US diplomats, CubaDebate (Oct. 3, 2017) (transcript of press conference); Bruno Rodriguez: Relations between Cuba and the US have fallen significantly due to the measures adopted by Trump, CubaDebate (Nov. 2, 2017); Havana says that Washington ‘lies’ about ‘acoustic attacks,’ Diario de Cuba (Nov. 2, 2017); Lugo (Assoc. Press), Cuba official accuses US of lying about sonic attacks, Wash. Post (Nov. 2, 2017); DeYoung, U.S. claims of health attacks on diplomats ‘deliberate lies,’ Cuban official says, Wash. Post (Nov. 2, 2017). Cuba Foreign Ministry, Cuban Foreign Minister meets with US Members of Congress (Nov. 3, 2017); Cuban Foreign Minister meets with U.S. legislators, Granma (Nov. 3, 2017). On November 1, 2017, the United Nations General Assembly again overwhelmingly adopted a resolution condemning the U.S. embargo (blockade) of Cuba. The vote this year was 191 to 2 (the negative votes by the U.S. and Israel), as shown in the following photograph of the Assembly’s scoreboard. 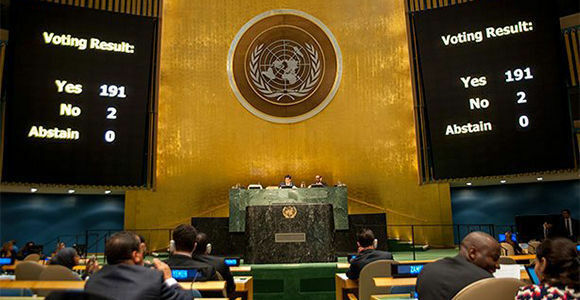 The debate on the resolution was preceded by (a) Cuba’s 47-page report, dated June 2017, on the previous U.N. General Assembly Resolution on the subject and which alleges that Cuba has sustained damages from the embargo totaling $130.2 billion (at current prices); (b) the July 26, 2017, Report of the U.N. Secretary-General containing statements in support of this year’s resolution from 32 U.N. organs and agencies and from 160 U.N. member states and 2 observers, but nothing from the U.S. and Israel, which prior to 2016 opposed similar resolutions and which abstained in 2016; (c) Cuba’s report on its achievements despite the embargo (blockade); and (d) Cuba’s report on the embargo’s impact on the country’s development. The actual resolution, “Necessity of ending the economic, commercial and financial embargo imposed by the United States of America against Cuba” (A/RES/72/42) had two principal operative paragraphs. During the debate, at least 38 other countries expressed their support of the resolution. The U.S. opposition was no surprise in light of the prior consistent Trump Administration’s statements supporting the embargo and the preceding request to do so from U.S. Senator Marco Rubio. The day before the U.N. vote, 10 Democratic Senators wrote to President Trump urging the U.S. to abstain on the vote. The “failed embargo,” they said, has been repeatedly and publicly condemned by the international community as ineffective and harmful to the people of Cuba. The longer we maintain this outdated Cold War policy the more our international and regional credibility suffers.” Moreover, “the overwhelming majority of Americana, including Cuban-Americans, and Cubans, including Cuban entrepreneurs and many dissidents, [plus international human rights organizations] oppose the embargo and favor engagement by the [U.S.] with Cuba. 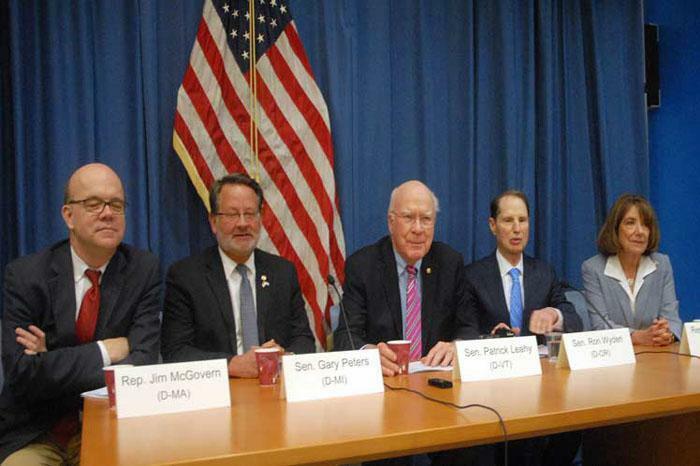 These Senators were Patrick Leahy (VT), Amy Klobuchar (MN), Chris Van Hollen (MD), Sherrod Brown (OH), Elizabeth Warren (MA), Jeff Merkley (OR), Jack Reed (RI), Edward Markey (MA), Al Franken (MN) and Sheldon Whitehouse (RI). As an U.S. citizen-advocate for ending the embargo as soon as possible, I am not pleased with the U.S. opposition to this resolution and to the very hostile tone of Ambassador Haley’s remarks. I obviously regret the U.S. abandonment of last year’s abstention by the U.S. on the prior resolution. U.N. Press Release, As General Assembly Adopts Annual Resolution Urging End to United States Embargo on Cuba, Delegates Voice Concern About Possible Reversal of Previous Policy (Nov. 1, 2017) [hereafter “U.N. Press Release”]; U.N., UN General Assembly again calls for lifting US embargo against Cuba (Nov. 1, 2017); Minute by Minute: The world against the Blockade, CubaDebate (Nov. 1, 2017); Reuters, U.S. Votes Against U.N. Resolution Calling for End to Cuba Embargo, N.Y. times (Nov. 1, 2017). A prior post covered the similar resolution passed in 2016 by the General Assembly, 191-0 (with abstentions by the U.S. and Israel). Cuba Foreign Ministry, Cuba vs. Bloqueo: Cuba’s Report on Resolution 71/5 of the United Nations General Assembly entitled “Necessity of ending the economic, commercial and financial blockade imposed by the United States of America against Cuba” (June 2017); U.N. Sec. Gen Report, Necessity of ending the economic, commercial and financial embargo imposed by the United States of America against Cuba (July 29, 2017); Cuban report on development. Cuba’s Foreign Ministry’s website has a special section on the embargo (Cuba vs. Bloqueo), which includes a scorecard of the General Assembly votes on resolutions against the embargo (blockade), 1982-2016. U.N. Gen. Assembly, Resolution A/72/L.2 (Oct. 2017). Cuba Foreign Ministry, Cuba denounces in UN force and intensification of the US blockade (Nov. 1, 2017); U.N. Press Release. Ambassador Haley, Remarks at a UN General Assembly Meeting on Cuba, U.S. Mission to U.N. (Nov. 1, 2017). Essentially the same message was delivered the same day by the U.S. Deputy Permanent Representative to the U.N., Ambassador Michele J. Sison. (Sison, Explanation of Vote at a UN General Assembly Meeting on the Cuba Embargo,U.S. Mission to the U.N. (Nov. 1, 2017). Letter, Senators Leahy et al to President Trump (Oct. 31, 2017); Engage Cuba, Statement on U.S. Vote Against U.N. Resolution Condemning the Cuban Embargo (Nov. 1, 2017).